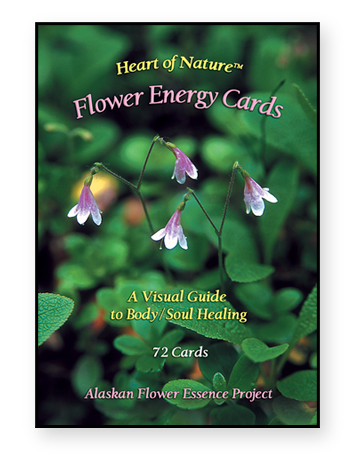 The Alaskan Flower Energy cards are the culmination of a 20 year dream. Steve Johnson is an expert photographer, and has so beautifully captured the plants and their energies in these cards. The images and affirmations vibrate with the energy of the Alaskan environment. They are a treasure! Flower Energy Cards This deck is based on the 72 flowers contained in the Flower Essence Practitioner Kit. They are an excellent adjunct to flower essence therapy and can greatly facilitate the selection process. Each card includes keywords that precisely indicate the healing qualities of the flower, and affirmations that you can use to embody the positive states of being they represent. An easy-to-follow pamphlet provides detailed instructions to help you immediately give accurate readings for yourself and others. Card size is 3.5 x 5.